LAST ENTRY is 00:30am – this will be strictly enforced. From 3am, the event will be one-in, one-out. This means that if you leave after this time, you won’t be able to come back in, and someone else who doesn’t have a ticket may be able to buy one on the door for £5. With the help of our friends at Half Edge, this Partisan fundraiser party is only happening because of Bruce’s support of Partisan’s work and vision – building a collectively-run hub of culture that raises money to give our space for free to support vital local social justice organisations. Thank you Bruce you massive legend ?? Featuring the legendary, world-leading chill-out room curators upstairs, MICRODOSING. “The first Half Edge party with Bruce was so immensely fun that by the time the lights came up we were already making plans to do it again. 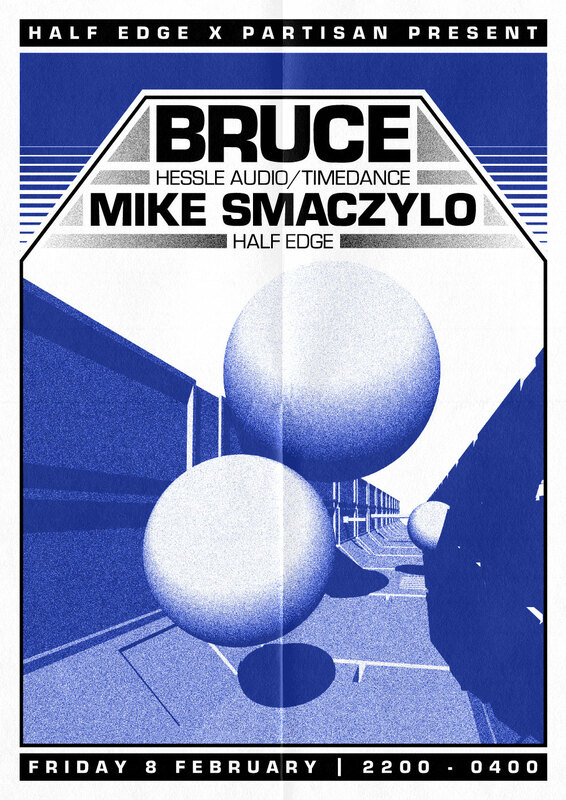 In the time since then, while we’ve had a couple of wicked parties with Phoebe Valentine and MLE, Bruce made a standout contribution to the iconic Resident Advisor podcast and became the first non-founding label member to release an album on the most important UK dance music label of the last decade, Hessle Audio. And what an album – Sonder Somatic is a precise and focused distillation of the numerous elements that made up his earlier releases: impeccable sound design underpinned by tight undulating rhythms, a minimalism of form producing maximal expression, the playful juxtapositions of noise and silence now developed into a controlled and subtle signature. Very much the work of a producer with a clear vision and mastery of his craft. I make no secret of the fact that Bruce is fairly indisputably my favourite producer, but there are also few people I’ve learnt as much from as a DJ. He traverses tempos almost imperceptibly and digs across times and genres always with an ear for interesting sonics, balancing harsh aggression with elegant control. Needless to say I’m extremely excited to bring him back, this time to my favourite basement in Manchester. See you on the floor. If you’re not a member yet, but you like the sound of what we’re doing, then we’d love to have you involved ? Join! BECOME A MEMBER >>> http://partisancollective.net/membership/ (more info within) ?